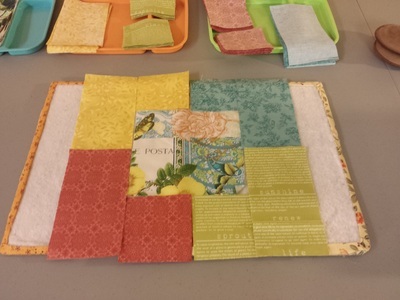 As most quilters know, this past week, in SLC, UT, it was the Spring Quilt Market. I didn't get to go. Of course, I don't own a shop and am not a market professional sooo....I wasn't invited either. But, that didn't stop my Instagram account from blowing up with pictures of updates from the professionals that I follow and the wonderful new fabric lines that were introduced. I nearly died from stimulus overload of all the wonderful goodies that were on display. Needless to say, all the beautiful creations that I swiped through got my heart racing and my fingers itching to quilt. So that's what I did. All weekend long (with some pausing only to drink, eat, potty, and check up on the happenings of Quilt Market). ​put on, so I consider it a win! 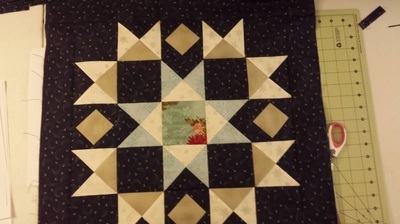 I was also able to get started on a quilt that my mom had wanted to complete, but, unfortunately, just didn't get around to it (time does get away from us all, doesn't it), so I'm glad that I am able to help her finally get this little lap quilt finished up. I'm also glad that she had already done all of the cutting, so that helped me save a whole bunch of time as well! 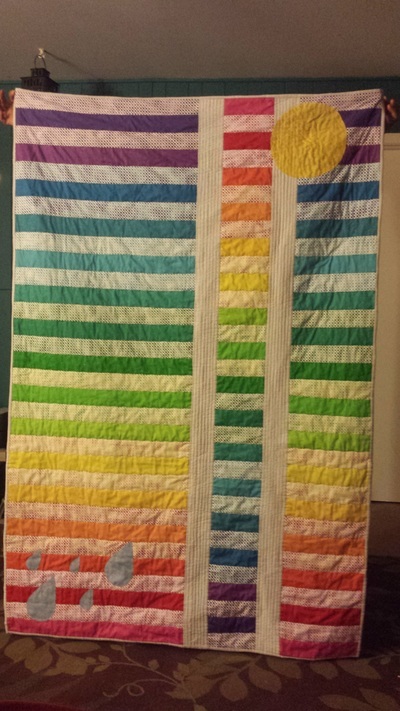 This quilt was for my grandmother, originally, but, as I said, time ran out, so now we are completing it in her honor. And since my mom is also a cancer survivor she can have this as a testament not only to her mother, but also to her own strength and perseverance. I think it's fitting for both of them, so I'm glad to contribute my talents. One day, I hope to receive that glorious envelope that will contain my invitation to Quilt Market. Until then, I suppose, I will just have to continue to live vicariously through Instagram posts and continue to dream of all the lovely things that I could make! 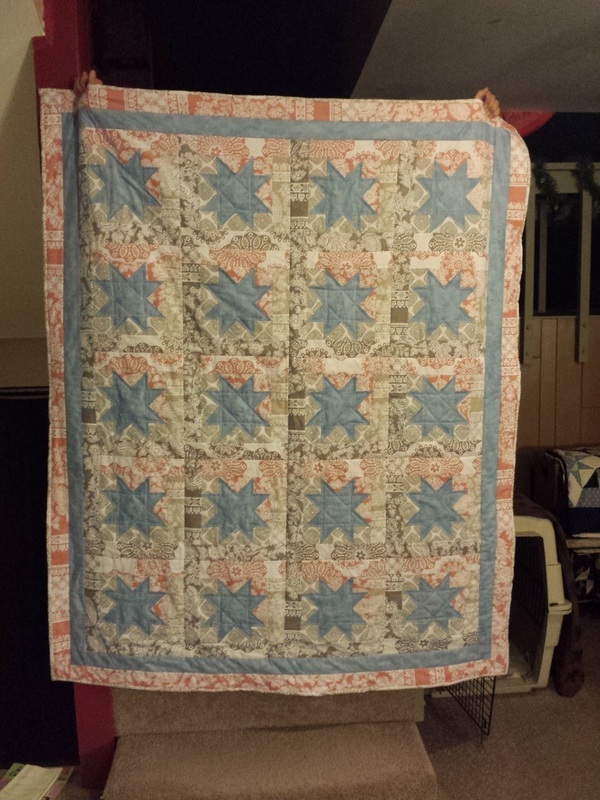 I know that I have been busy, but I can't believe that it took me all the way into March to finally complete my first quilt of the year. 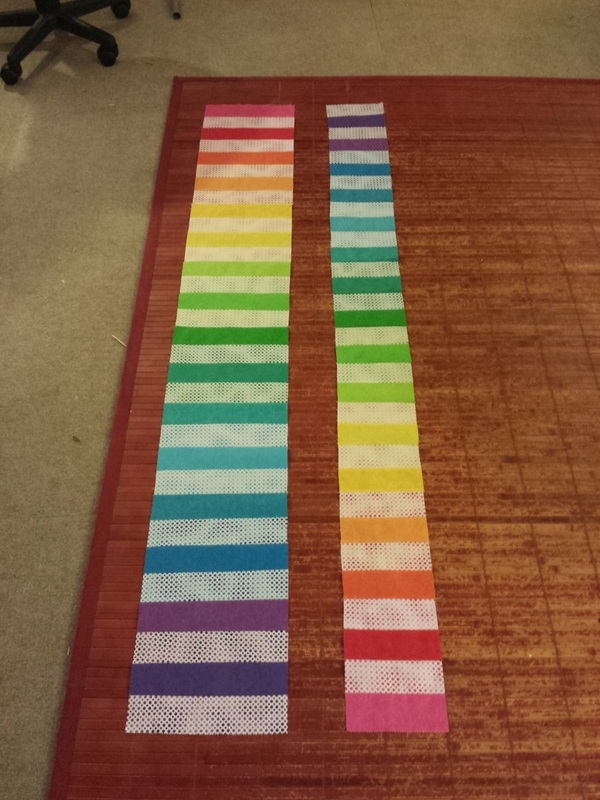 It was supposed to have been done in January (I had started this year with the lofty goal of completing a quilt a month - needless to say, that resolution went completely out the window!) But, at long last, I got my "January Morning" quilt finished and am now currently enjoying it's warmy goodness when I am on the couch at night. Since things are a bit tight right now, I've been having to work on projects that I already have the fabric for (no Bee Creative fat-quarters for me at the moment), so that means that I've had to inventory what is in my stash and start determining which projects (or at least quilt tops) I can get done with what I have...for now. *grin*. One such project is a window box pattern that I've had in my stash for quite some time now. 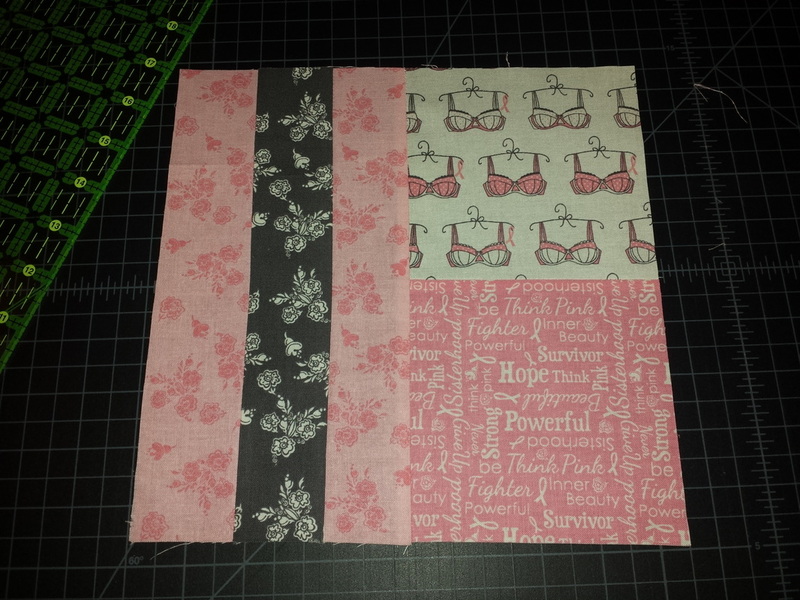 Luckily, it's a real simple pattern and I've been able to get it together rather quickly. Although the top is nearly done (I just have to figure how I want the borders to go), I am going to have to put the top aside and begin on another project. 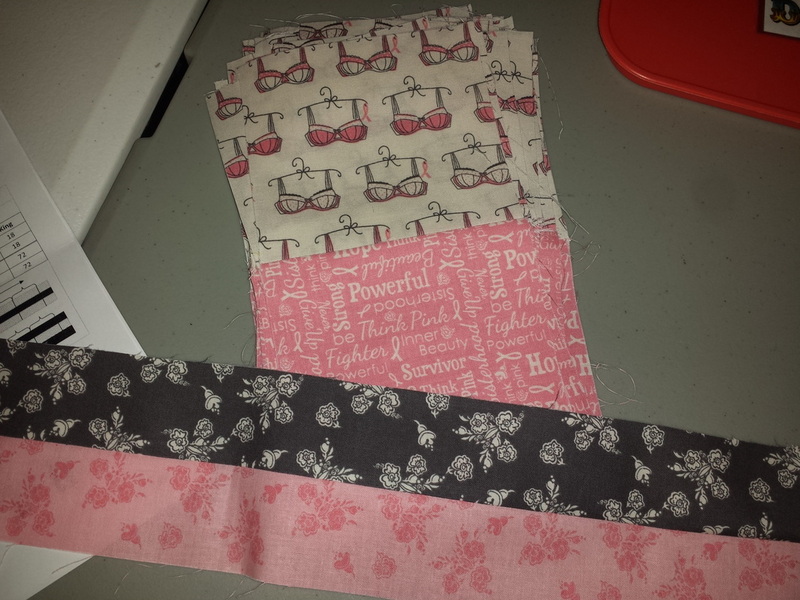 I have some fabric for placemats...maybe that will ease the void of not being able to buy more fabric for now! 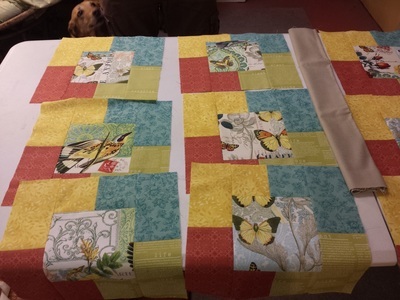 In the meantime, here's a quick look at my "Window into Spring" quilt top. Ok, so I didn't maintain the blog as much as I should have during the summer. What can I say? I was either outside either enjoying the warm weather, or downstairs in my basement avoiding it. 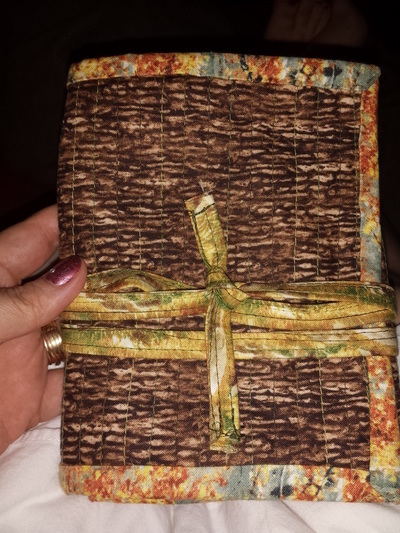 And since I was down in the basement...well...I quilted! 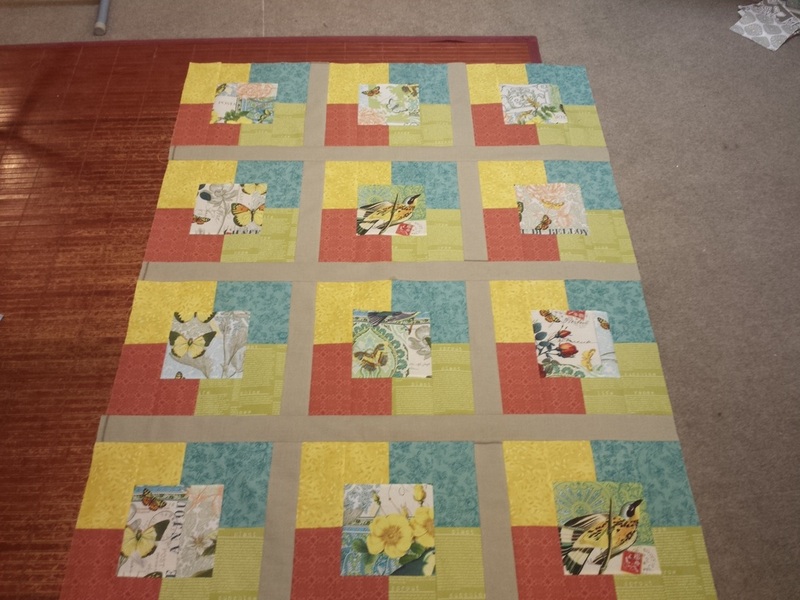 What else was I going to do if that is where my quilting room is?! I have to admit, I got a bit distracted with some of my projects and haven't quite finished the ones that I had started...*cough - Winter Wonderland - cough cough*. 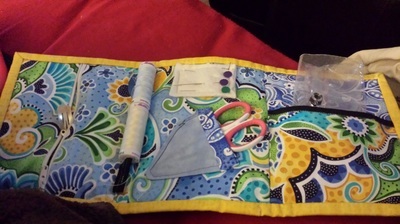 Ah, well...that's the glory of quilting (and I think part of it's curse as well), is that there are so many wonderful patterns, projects, and fabrics out there that just when you think that you've got a handle on your current list of things to make, something new and exciting catches your eye. Sigh. 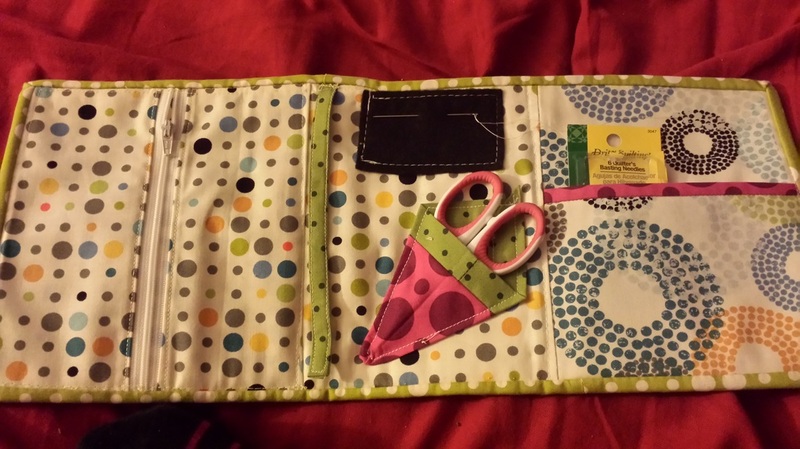 Here is an example of some potholders that I made using the scraps from my son's Scouting quilt that I made him. 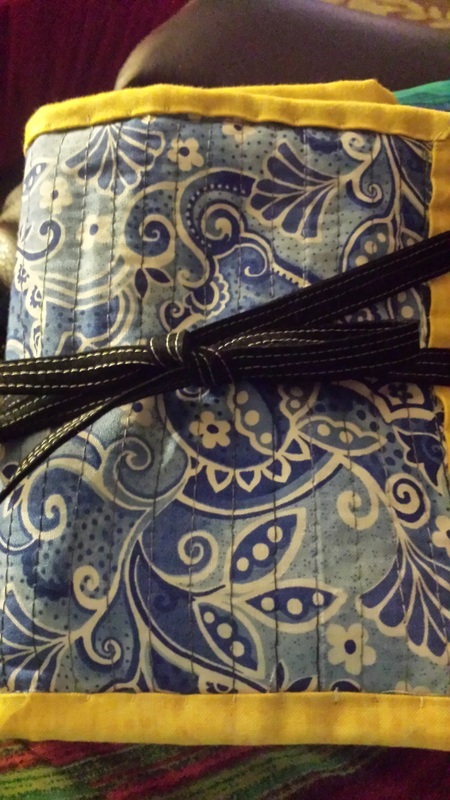 I used The Boathouse fabric by Moda. 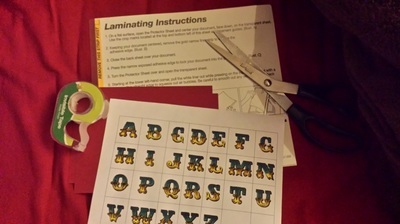 Here is where I made my own Alphabitties - you know, those little letters that some quilters use to help keep their cut pieces organized. I wanted to make my own because I like the font that I chose, versus something that was just plain and boring. Plus, it was cheaper this way. All I did was insert a table into a Word document, type in the ABCs (one letter for each box), and chose a font that makes me happy. 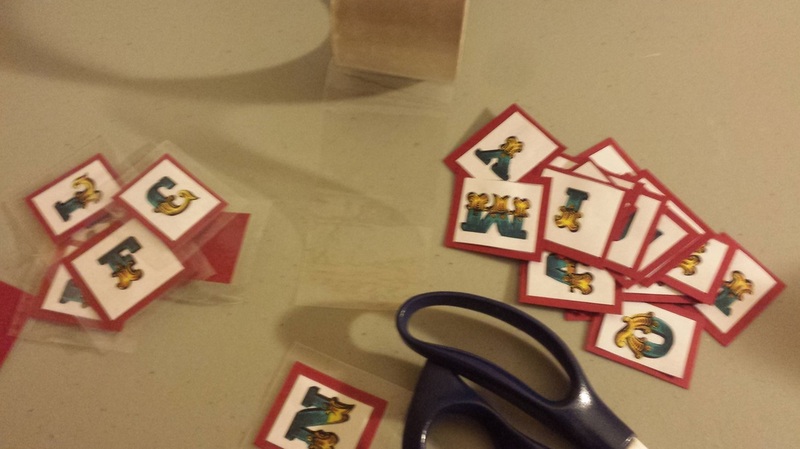 Then I cut the letter boxes out, glued them to some cardstock, and put laminating paper over them. Ok, actually, I used packing tape because I didn't have enough of my laminating sheet, and it was cheaper to use what I had on hand, versus going out and spending as much on laminating sheets as I would have to buy the dang Alphabitties in the first place. Done and done. Either way, they are super cute and fun to make! This past June, The Monk and I went to visit my BFF and her family in Minnesota (that was a drive, let me tell ya!). 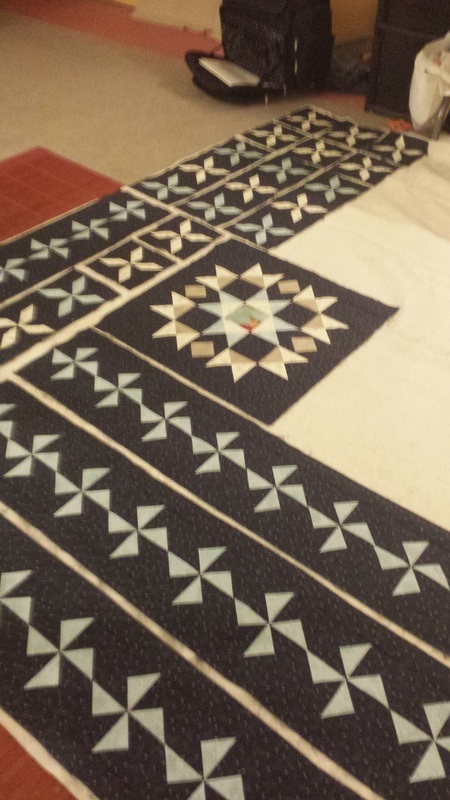 While there we, of course, had to hit several of the local quilting shops. 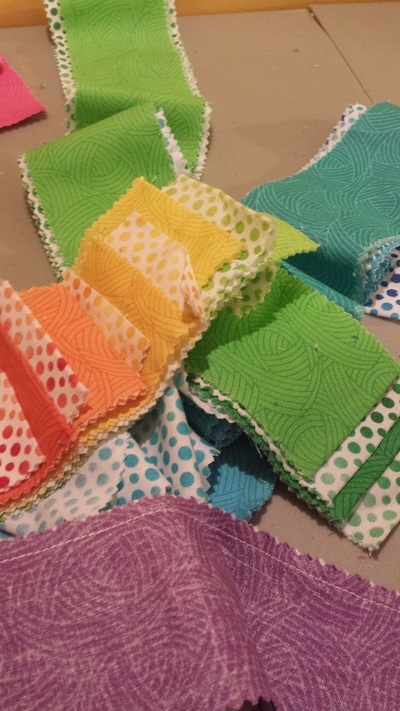 While on one of our treks, The Monk happened to spy these delightful jelly rolls by Quilting Treasures, and he immediately told me that he wanted me to make him a rainbow quilt. How could I possibly tell my adorable little soon-to-be 8 year old no? So, after piecing it together and deciding out to split it up (I had no pattern for this, just instinct, and random pictures on Pinterest), I appliqued a sun and some raindrops on it. 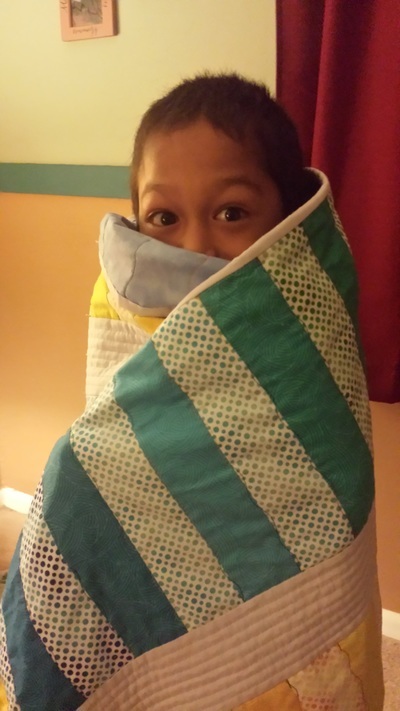 Needless to say, The Monk loves his quilt and won't take it off his bed because he doesn't want to get it dirty...which...really, is saying something for a little boy who loves to play in the dirt. 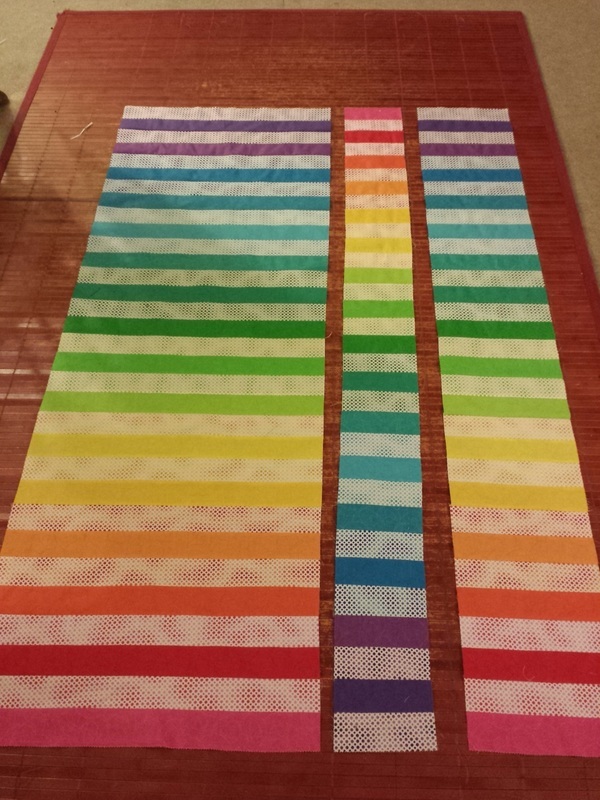 After discovering that I had purchased The Boathouse jellyroll rather than Sweetwater's Elementary jellyroll for our homeschool quilt that I'm making (the pattern is Sweetwater's Math Class), I had to do something with all the strips that I had already cut up. Luckily, The Monk fell in love with this fabric, so I suggested that I make him a quilt that he can take on all of his Cub Scout camping trips. He absolutely dug that idea (of course). 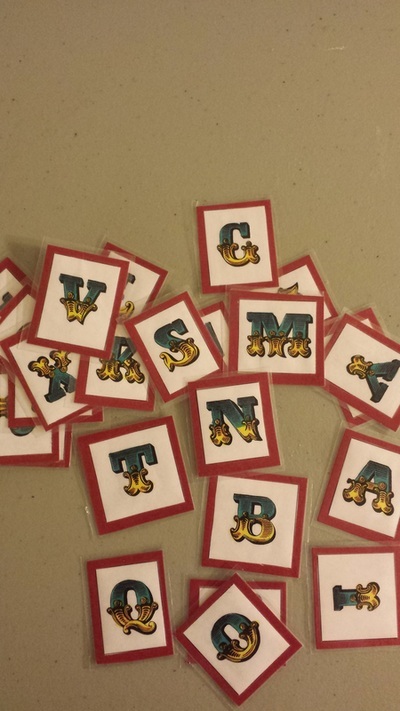 So here is the project as it is coming (I haven't really put that much energy into it, as camping season has come to a close, and I got distracted by making binding kits, but more on that later). However, the promise has been made, so I have to finish it rather than not. 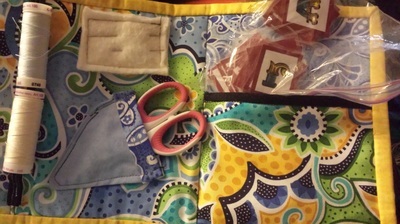 I hope The Monk realizes what a lucky little boy he is for his momma to be making all of these quilts for him! Here's a little cutie I found on fatquatershop.com under their free patterns. I wasn't sure how the pink polka dots were going to look, but I actually really love this! it's very cute and really wasn't that hard to put together. Definitely a weekend project! And it's these cuties that have been keeping me away from some of the bigger projects that I need to finish. I found the pattern for these also on Fat Quarter Shop's site, but they truly come from Lella Boutique. I first spotted them on Instagram and it's been down hill from there. 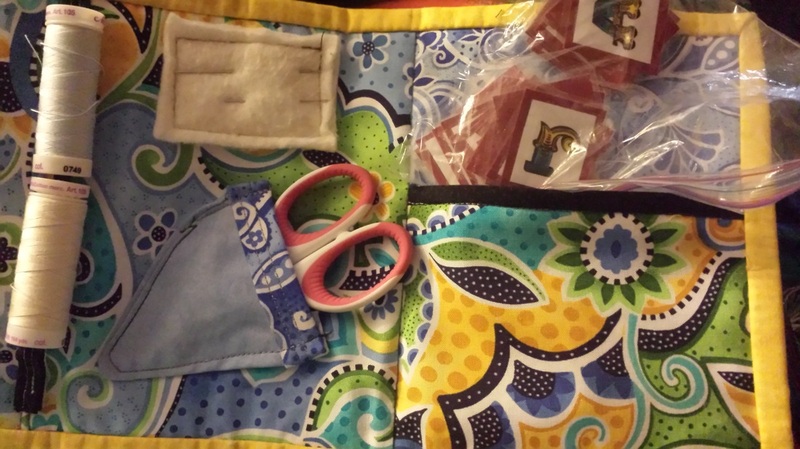 I'm currently revamping the pattern to fit a cross stitch pattern and all the supplies that go with that, so it's going to be bigger with a wider zipper pocket. I've almost got that finished up, but since I'm making it for me, rather than for someone else, I'm putting more bells and whistles into it. Well, that's what has been keeping me busy during the hot summer days. 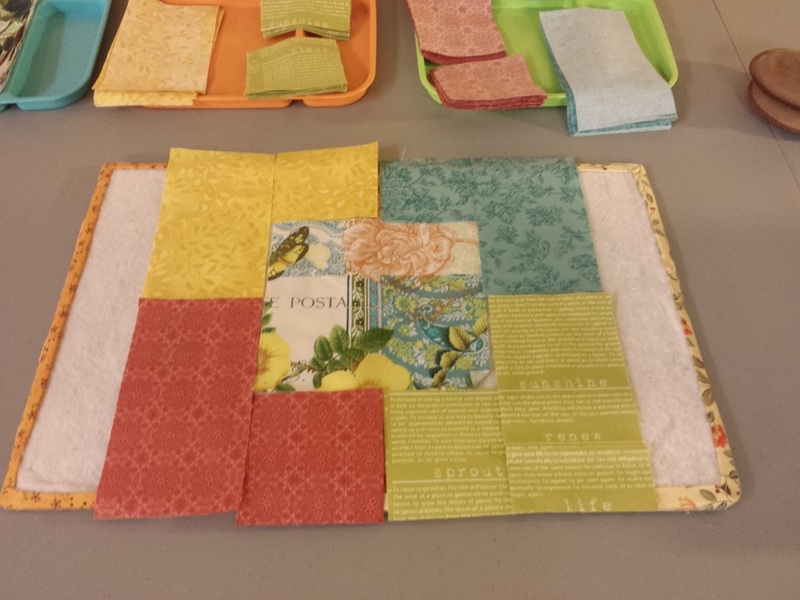 We'll have to wait and see how often I get into the quilting room now that school is back in full swing. Until then... Cheers! I seem to have developed an addiction to fabric. I can't seem to stop buying it. And it's not that I really need it. I don't. I have a ginormous list of projects that need to be completed, much less the ones that I haven't even started. And the patterns!! OMGoodness, the patterns that are out there! And a lot of them are free! I can't even...sigh. It's terrible. 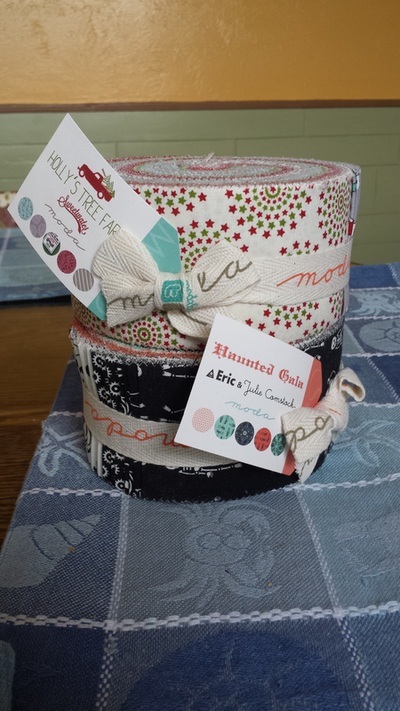 And I'm burying myself into a hole, not only in the number of quilts that I want to do (and have to finish), but also in the fact that my husband is getting tired of me asking to buy "just one last jelly roll, I promise." Poor guy. I really do have to stop. He's starting to get mad, which for him, says something. It might help if I didn't follow several fabric companies and quilt shops on Instagram. But they are all soooo pretty! I know, pathetic. 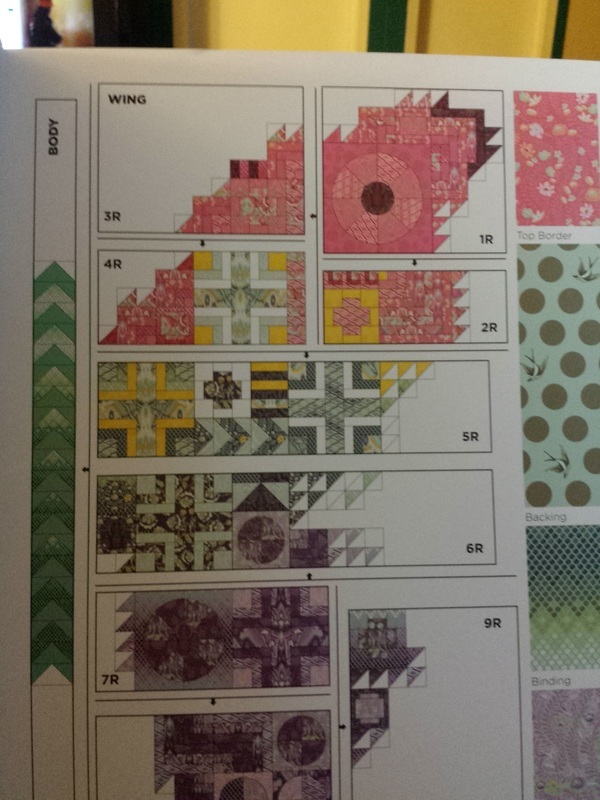 But, now I have plenty to keep me busy for the upcoming months until my local quilt shop starts having classes again. 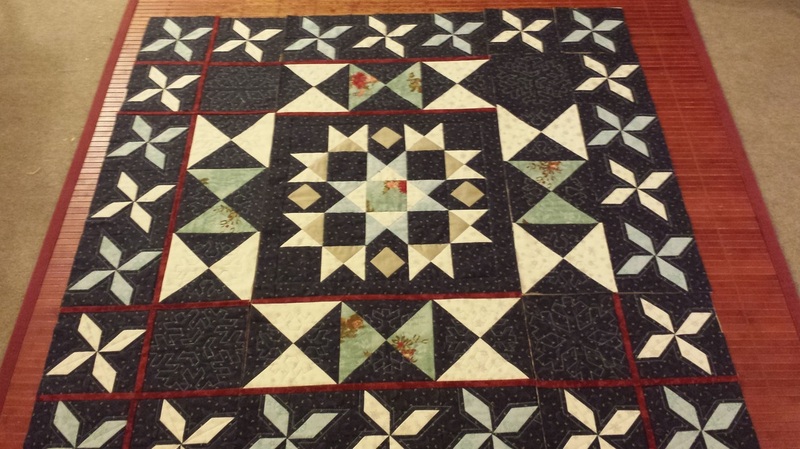 I have a few summer quilts to do, a Halloween one, and a Christmas one that I can start. Plus, my white whale (which I have promised myself not to start until I get a few others out of the way and I can take the time to really pick out the fabric that I want to use on it). Now, if I can just get everyone to leave me alone so that I can actually get some quilting done, that would be great. 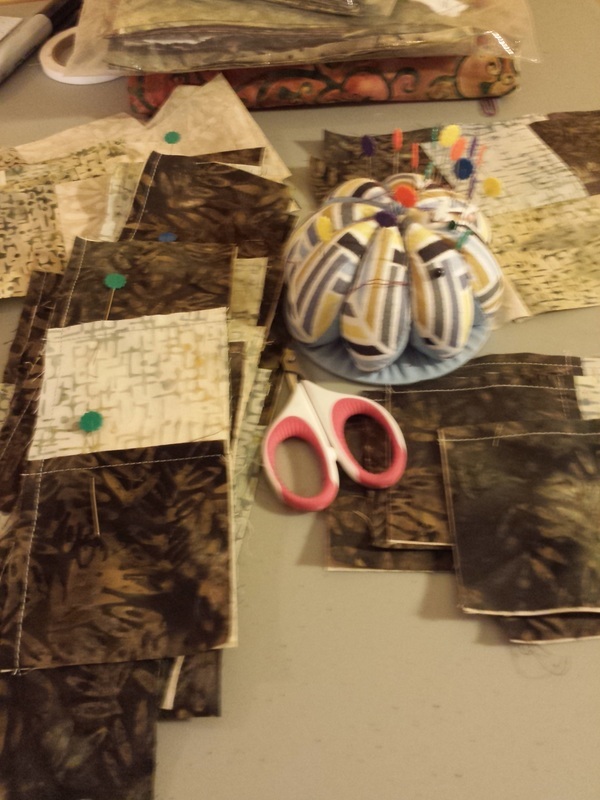 I finally took some time and organized all the various scraps and pieces of fabric that I have. 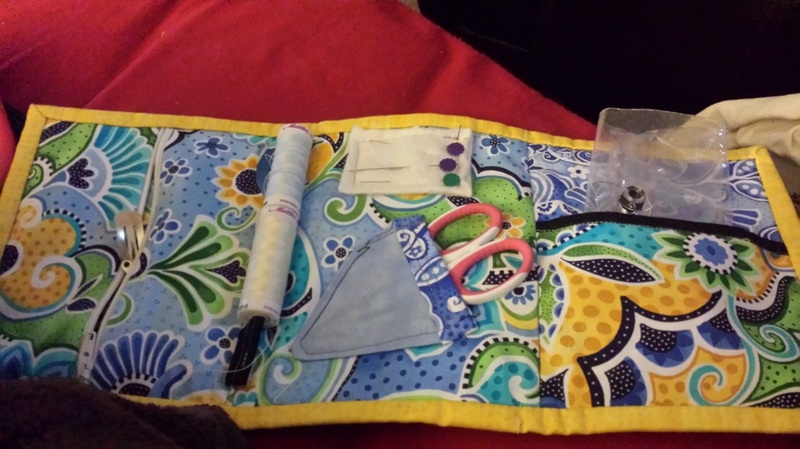 I have to say, I never realized that I had so much (which is funny, because I am constantly looking at, and think about buying, more - but I think that is a quilter's curse!). And I suppose that it's a good thing that I have so many, because there are a ton of projects that I have lined up to do (and that doesn't count the UFOs: unfinished objects). I can't help but love the fabric and patterns that are out there and I want to own them all. I love creating things, whether it's through cross-stitching or quilting or felt. I have always been an artist, so I guess it's just in my blood. And it doesn't help that there are so many great patterns out there. 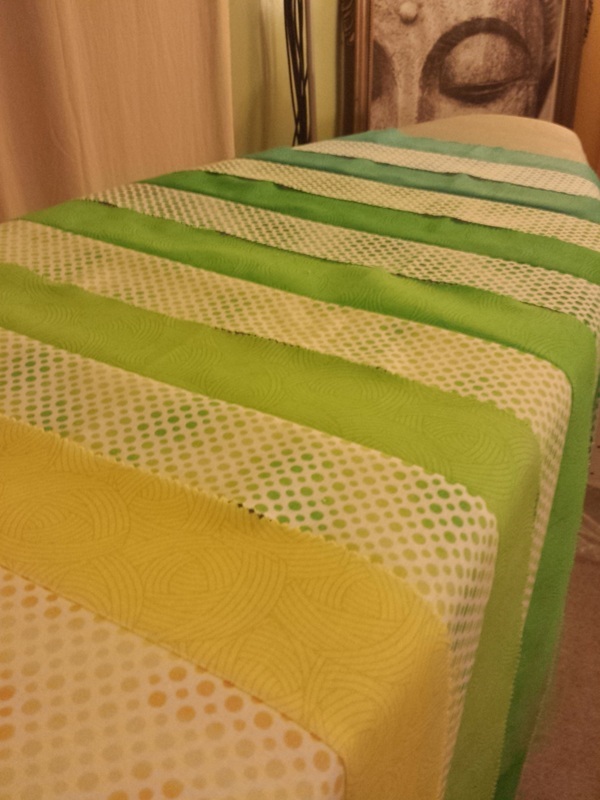 The biggest problem I have in my quilting room though are the UFOs. While I love piecing a quilt top together (designing it, picking out the fabrics, and sewing them all together to watch something form is the best part! ), I have discovered that I am really not that into finishing a quilt. 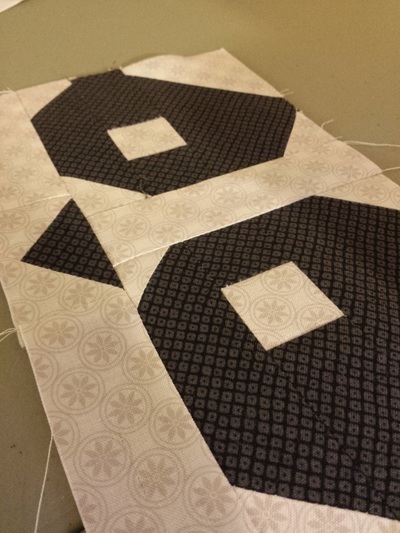 I suppose that I am still rather intimidated by the actual quilting part. Sure, I can sandwich it all together, but the idea of stuffing a rather large quilt through my tiny little Brother is...well...cumbersome. It's really hard to quilt a big quilt on a tiny home machine (even if it is quilt as you go). Plus, I admit, it is rather difficult to lay out and baste a quilt on the floor with 2 nosy dogs who want to be a part of everything that you do and a rowdy little boy who just wants to hang out with you. 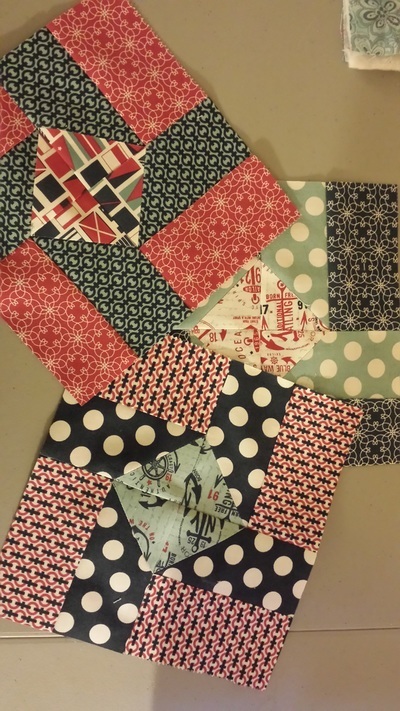 I typically have to wait until I have a day to myself (which is few and far between) to lay out a quilt and get it basted and quilted, but by then...I'd rather be doing something mindless. Like play video games (yes, I'm a gamer). This is when I wish I could afford a long-arm....sigh. Anywho...back to the original topic. Everything is labeled and separated by project. 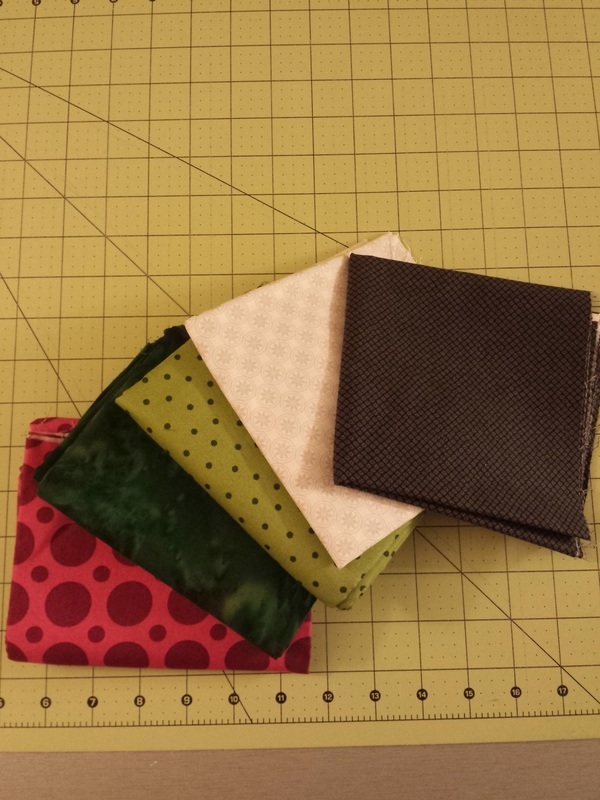 Or, in the case of my scraps, by color. I feel a bit better and, now that I've commandeered my mother's ironing board, I can get some things done (like a few of those UFOs...maybe). But, I know, that there will always be projects lined up in my quilting room, waiting to be started or finished. I have the quilter's bug and I'm pretty sure that there is no cure. 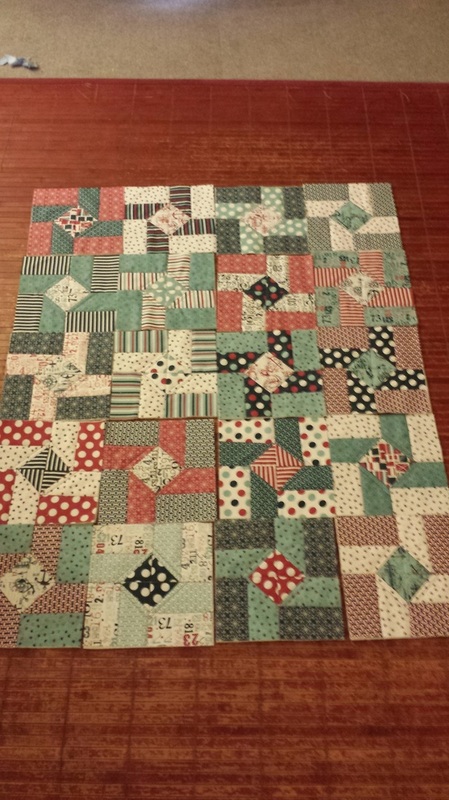 Ok...so I have a love/hate relationship with scrappy quilts. While I have always admired their haphazard nature, I have always known that there is no way that I would ever be able to pull one off. I'm not random enough and my OCD would go berserk if I ever attempted something so mismatched. 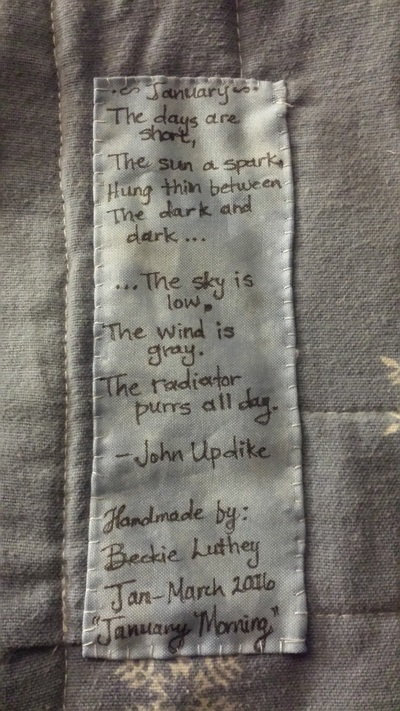 I have also really loved that eclectic feel of farm quilts, with their old fashioned style and fun attitude. But, sadly, once again, I have no ability to make something that is unbalanced. It just drives me nuts when something is random and chaotic. I just can't hang. 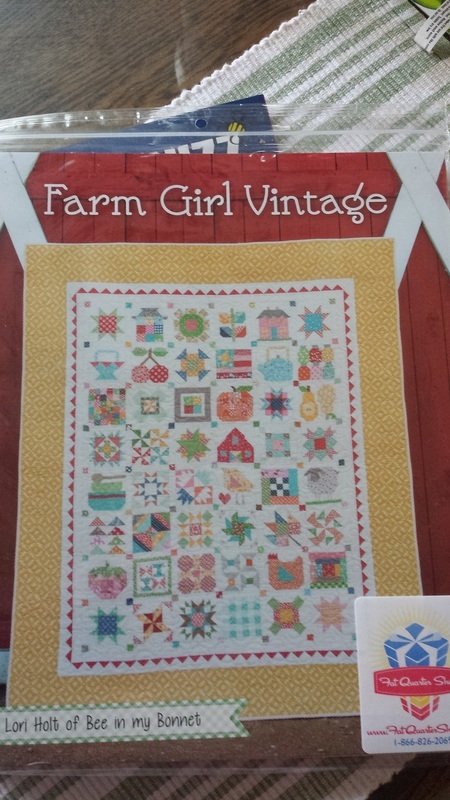 So when my Farm Girl Vintage book arrived, I did a little jump for joy (because the designs are truly adorable) and a little sigh of despair (there was no way I was going to be able to make a quilt like the one on the cover). That's where my graph paper tablet came in (I'm lucky enough to have a husband who works in an engineering office and can get me big pads of graph paper!). I pulled out my pad of paper and my mechanical pencil and I set to drawing out the farm girl quilt I knew that I would be able to create. I wanted my quilt to tell a story and to represent our own little homestead out in the middle of almost-nowhere Colorado. We raise chickens, have a rather large veggie garden, I have a canning day (or days) every season, and I bake. 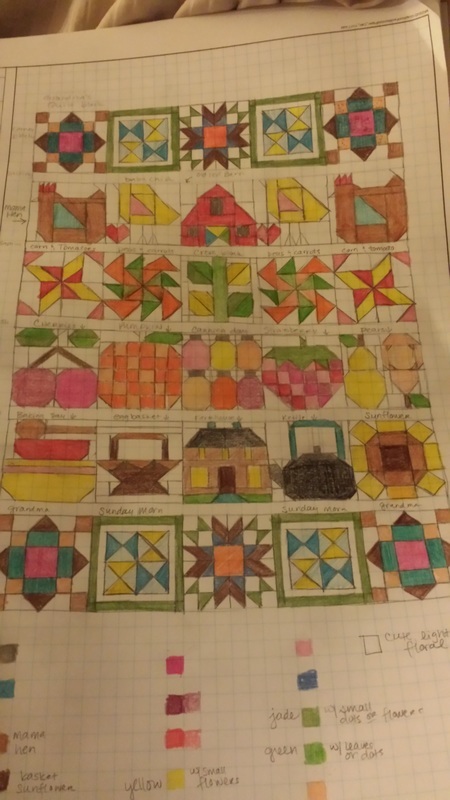 It's these things that attracted me to the farm style quilts to begin with and I wanted to showcase them in a quilt that we can use everyday here at home, so that's what I based my design on. I'm also thinking that I'm going to do this quilt as a quilt-as-you-go style, completing one block at a time with batting and backing and then putting it all together with binding/sashing. Granted, I probably won't even be able to get to this quilt for many, many months, since I have a back log of quilts that I want to make, but...then again...since those other quilts are already put away into boxes and are stored nice and neatly...well. There's a bunch that goes on in my life. And, sometimes, when I feel really down or, especially lately, feeling especially stressed out, I take a moment to do something fun with my nails. Now, they don't always turn out salon perfect, but hey, I'm doing these things on my own, and to be honest, for the most part, they turn out alright. Not perfect, but definitely more fun than just plain ol' colors. And since I'm not doing them for anyone else, I don't really care if they are all that perfect or not. This started when I was teaching in public schools. I would paint my nails all crazy and fun because my kiddos always seemed to think it was fun to see what my nails looked like while I was doing a demo or talking up at the board. It was always a great conversation starter and, I figured that if they could see that I was human enough to do fun things with my nails, then I was human enough to have their trust to teach them as they deserved. Since I left the public classroom, now's it's become something that I use to express myself a little more just for fun. I mostly take the time to do my nails on Wednesday nights while the boys are at Cub Scouts. This is my time to just chill, have a nice warm cup of tea (or sometimes, a glass of wine), put some re-runs of The X-Files (right now I'm about half way through Season 2) on Netflix, and decide how I want to do my nails for the week. I really enjoy this little ritual of mine because it is exactly that...mine. My time to myself to be a little fun and funky. I've always considered myself a pretty good cook. I have followed recipes since my grandmother helped me bake my first cake at 7, and since my father told me the importance of recipes, but that it was OK to stray a little. So, this morning in a burst of pre-coffee genius, I decided to add just a cup of cake mix to my pancake mix this morning. This proved to be interesting. While the pancakes themselves are rather scrumptious...they tend to be a tad delicate in cooking. Translation: They burn...quite easily. And this, dear friends, poses a problem. Neither the boy or I will eat burnt food. Ugh. Needless to say that it is lucky there is cake mix in this better, otherwise I don't think The Monk would eat breakfast this morning. This quilt hasn't quite been the bane of my existence, but I will say that I really hate pinwheels and that I went around and around with my teacher about half-square triangles. Still, I think that this Midnight Winter Wonderland is turning out better than I had expected. 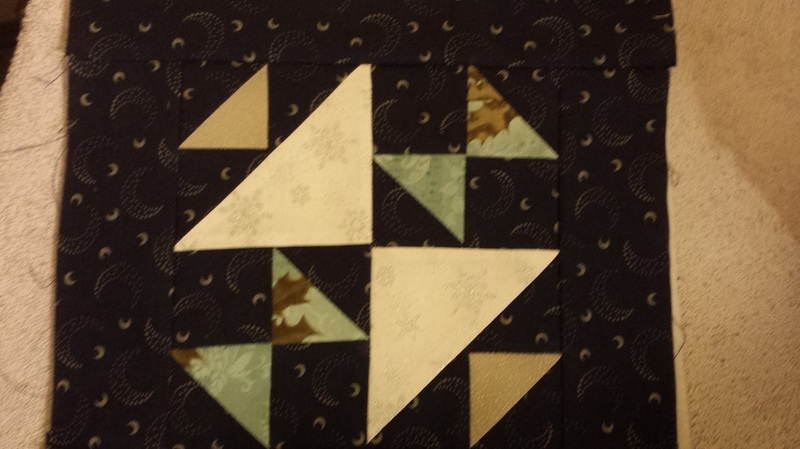 It's my first quilt doing pinwheels and the hst (half-square triangles), but I don't think that I'm doing too terribly bad. I only cut the points off a few triangles, and for the most part, most of my seems are matching up rather nicely if I do say so myself. I'm still rather behind on the whole quilt-as-you-go process (which mean, basically, that I haven't quilted any of pieces that should be quilted at this point) and we're coming to the point where I actually need to have sections quilted so that I can start fitting everything together. BIG SIGH. It's just so hard now with the weather being nice and warm and things needing to be done in the garden (both here and at my parent's house), plus beginning the transition into 3rd grade, I just feel as though I don't have time. But I am trying. We are working really hard to have the afternoons free to do our hobbies and such. I think that's the only way I've been able to get any work on this project done at all! Update (May 5, 2015): Ok...I have most of the project done actually. 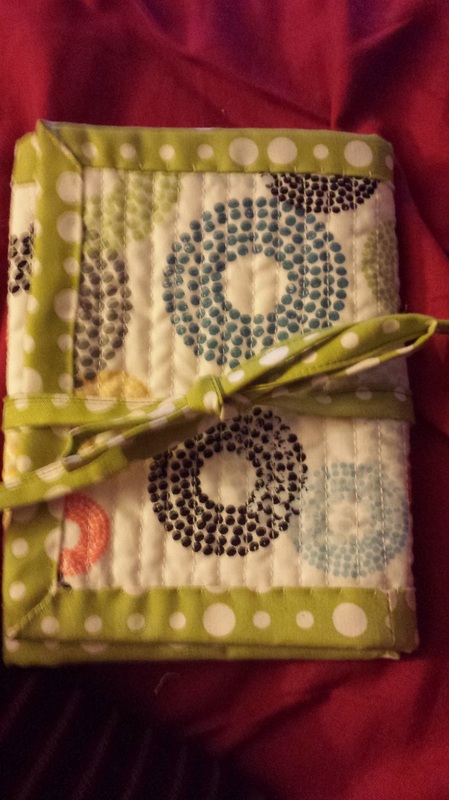 I have things quilted and bound. I'm only missing a few of the edges and I need to finish adding swirls to a couple of the border pieces, but other than that, I can almost call this thing done. 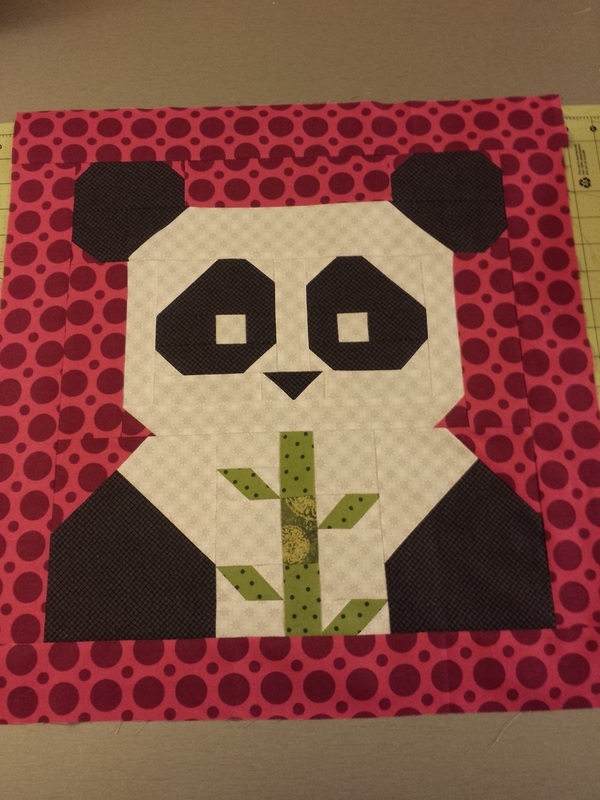 Granted, I have a few other quilts that I've started in the mean time, but I truly am hoping to get this beast finished by the end of this month...or maybe June...Ugh!